1) Poetic License Green Shoes - I couldn't help getting these from Mod Cloth--I really couldn't. It's just that I've never felt part of the "women love shoes" thing because I've never found a pair of shoes I loved like these. When they arrived in the mail and I put them on, it felt like they were growing from my feet (no, not like some green mold). Green leather shoes to go with my green leather satchel (oh, and my two pairs of green tights and my green headphones and my green perfume bottle and my green-painted bedroom and my green pasta strainer and my green drinking glasses and I'd better stop while I'm ahead). They're beautiful, and they're fairly comfortable as far as heels go. I'm not always good at walking in heels, but these are fine for me. They have a slight vintage, a slight nerdy fashion, a slight girliness, and a slight Lemony Snicket look. 2) World Market Tea Cup/Infuser - Finally, I got an alternative to a metal tea infuser. This cup from World Market has its own porcelain infuser that allows the tea to infuse throughout the whole space--it brews perfectly. Yes, I usually end up with some tea leaves at the bottom, but what's actually wrong with that? 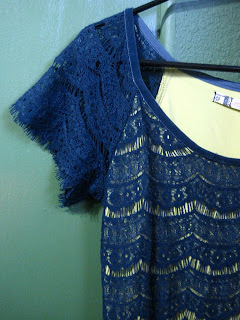 3) Blue Lace Chelsea & Violet Dress - This was a Christmas present. The dress is just above the knee, in a fairly straight shape that isn't too tight but also not quite 1920's loose. I wore it out with my green shoes. Underneath the blue lace is a light, slightly electric green that adds a fun, colorful vibe. 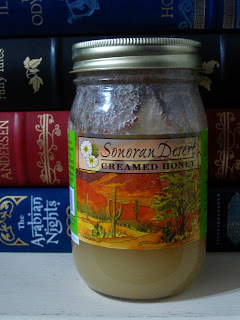 4) Creamed Honey - This honey gives all the extra flavor that raw honeys do without having that thick texture. 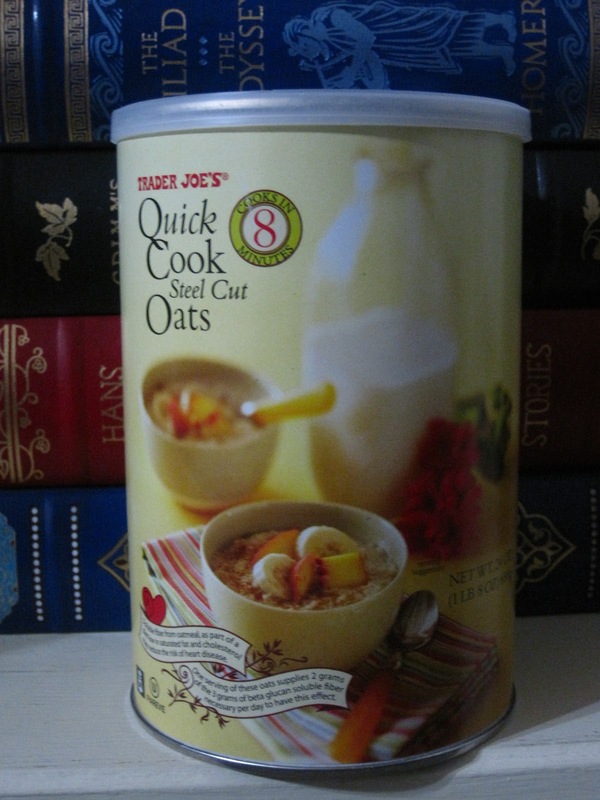 I've been spreading it all over toast and scones and adding it to oatmeal. 5) Brontë Poems - I don't want to take this book back to the school library; I really don't. I've been reading a little a day to make it last longer, but it's as much the idea of this (out of print) book that I so much like. I wish it were actually mine. 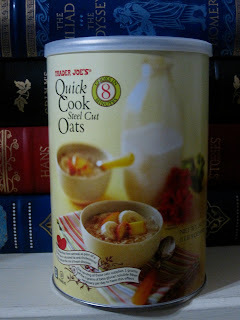 6) Trader Joe's Steel Cut Oatmeal - I think I've mentioned that I have an on/off relationship with oatmeal, where I have to give it a break often otherwise I stop liking it. But the steel cut type is much more interesting; it's almost crunchy (though I'm not sure if that sounds appetizing) in texture, so it's more entertaining to eat. I find I can eat it more often than regular oatmeal. 7) Purple Tie-Dye Scarf - This was one of those items where someone let me have it, if I wanted it. I wasn't sure about the color, but I took it in the hopes that I could do something with it. Turns out, it makes a nice accent to outfits, a pop of color, as it were. The material is a light silk, so it isn't a heavy, cold weather style. 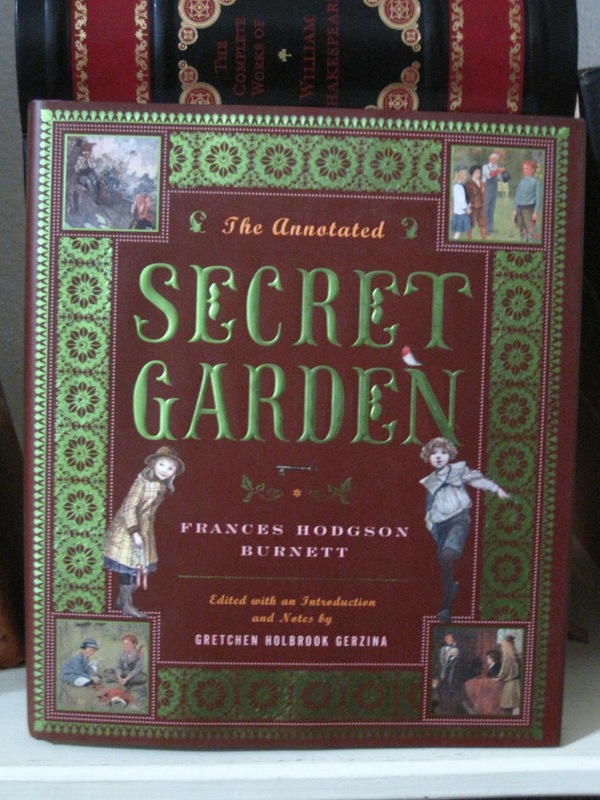 8) The Annotated Secret Garden - I was ogling over this book at Barnes & Noble months ago, then when I finally was ready to buy it they were out. So I absolutely couldn't pass it up when I saw it again--come on, it was $10 in the Bargain Books section. That's giveaway for an annotated book. And Frances Hodgson Burnett is fabulous. 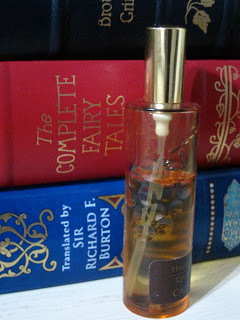 9) Caudalie Divine Oil - Back during the holiday time, I picked this up at Sephora, thinking to give it as a gift. But then I lifted the cap and smelled it when I got home--I thought it smelled "old lady," if you'll forgive the phrase. So I decided I couldn't give it as a gift and kept it instead. It says it's for face and hair; I haven't used it on my face since I'm happy with my Thayer's witch hazel/rose petal toner and my raw shea butter (seriously, it's like miracle cream). But I like to put it on my hair sometimes at night when I feel like my scalp is getting dry with the colder weather; it's nice. And originally I bought it for the bottle, which I still think is pretty. Though you can't see it well in the picture. 10) Life Factory Glass Water Bottle - This is amazing, exactly what I had been looking for for a long time. I carry a water bottle around everywhere and I was getting frustrated by the fact that even in the "hippie" stores the best I could find were BPA/etc.-free metal and plastic bottles. That's not good enough. This bottle is glass with a silicone cover to make it look cool and keep it from breaking. I picked out the Tiffany blue color for a classic, versatile look. 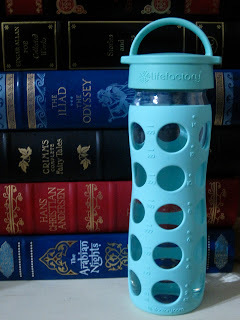 Previously, I was using a glass Tazo tea bottle--but glass nicks easily. I've only had this bottle since yesterday and already I am in love. This is the 16 oz. and I'm thinking about also getting the 9 oz. (there are also a 24 oz. and baby bottles). Long, long ago (that is, nearly four years ago), I posted on how I identified with certain of Hamlet's traits. He has long and rambling emotional thoughts, but is slow to action--call it a fault or simply his nature, as you will. But now I'm thinking of another character who makes things more complicated than they necessarily need to be. She is another literary character I should hesitate to admit I identify with, but oh, how wonderfully are her thoughts and struggles described. This book makes me weep, mentally. But on to my comparison. Lucy doesn't have a direct order/object she is hesitating to carry out, but she is searching for something on her own. Lucy wants friendship, companionship, love--a full life, if you will. She succeeds financially, but her attainment of love and communion are achingly temporary. While Lucy didn't drive M. Paul away like Hamlet did to Ophelia, she did lose him. And her friendship with Dr. John essentially faded, or faded from what it could have been--if Lucy had seized action a little more. Lucy has a terribly low self-esteem, something I'm glad to say I don't share. She's unlike Hamlet in this regard: Hamlet thinks over all his doubts, but he's also so quick-minded that his problems with himself aren't Lucy's. I guess that's why both these characters have generated so much analysis--and mixed feelings. Villette is sometimes called ahead of its time (which I completely agree with), but we do know that Charlotte read Shakespeare. Do you think perhaps Hamlet affected Lucy Snowe, or would that statement be stretching? When I only have an hour available, it's easier to just watch a TV episode on Netflix: it's hard to find an hour long movie. Even when I have an hour and a half, I still might choose to watch two episodes instead of searching for a movie that's only ninety minutes. And when it's one of those weekend days where I just want to crash for a while, well, it's easier to keep clicking the next episode than to watch a series of movies. Even on different days of the week, if I watch a movie almost every night, it can get exhausting to sift through so many stories--TV shows offer more fluidity. With the rise of Netflix, along with Hulu and Amazon Instant and whatever else is out there, more people are watching TV shows online. And I wonder how much this correlates to our growing demand that shows offer an over-arching plot instead of just having individual plots for individual episodes. If you're watching two or five episodes of a show in one day, or finishing an entire series in a month or two, it's hard not to have an over-arching plot. The show gets repetitive in a way that it wouldn't have if you'd been watching it on TV, one episode a week. We're starting to treat TV shows like movie franchises: we want each episode to be part of a plan. While watching a show on TV always leaves the risk that you might miss an episode and also an important part of the plot, if you're watching online that will never happen (well, not on Netflix, anyway). The audience is shifting from once-a-week casual viewers to viewers who are investing a devoted, if sometimes short, amount of time to watching the show. That changes what the dynamics of the show need to become in order to suit this viewing style. I was flipping through the book's introduction, looking for a quote I'd marked for my research. I was on track--but then I got distracted for half a second. Flipping through this book, I reacted to it. Ew, I thought, it smells like a new book. And it was a new book. In the piles of books I'm using right now for this project, many are used, a couple are new, and one or two are getting old. It's the old ones I delight in: while flipping their pages, I bring my face closer and breathe in that vanilla smell. It smells like adventure, decadence, history, loss and joy, and triumph. But new books, new books just smell like paper. Bleh. So boring, so untainted, so plain, so blank, so unrefreshing. Which is funny considering that everyone talks about new car smells, new apartment smells, new whatever else smells. With these, the new smell marks a pristine quality, a newly-and-perfectly manufactured product. But books aren't like that. If they are new, that means no one has read them yet. Once they begin to age, it means they have been enjoyed and treasured for years, the pages have been flipped countless times in devotion. They become richer with experience, rather than hopes for the future (like looking forward to taking that new car out for a ride). I'm also so amused now that books I once bought new and pristine in bookstores are now beginning to turn into fragrant vanilla books. My library is aging--and that delights me. It isn't that I don't appreciate the importance of clouds. They're part of the environment, yes, and without them the earth would be a very dry place. Yes. But they're so oppressive, all the same. Note that I make a distinction between storms and clouds. Storms can be fun, exciting and thrilling things that they are (think of how Lucy Snowe talks about them in Villette). But clouds, when they spread their heavy cover across the sky and press down on the world with darkness, can be difficult to bear. This is the tumultuous time in Phoenix. Not long after I got back here from the holiday break, there was a 47 degree or so high, followed a few days later by an 80 degree or so high. Oh, how happy I was to see the sun. I sat in front of my favorite tree on campus (yes, in four years I have come to have a favorite tree), enjoying the grass and the sun while I did some reading. Within a half hour, the five trees surrounding me also had been occupied--now that's a trend I'm proud to start. But the sun is gone again, leaving not so much cold in its place as darkness. It looks like the cloudy, half-rainy weather is lasting at least through Monday. I may begin to feel like I'm stuck in Byron's (awesome) poem "Darkness." Winter rains just aren't the same as summer storms: they're much more oppressive and depressing. I suppose I must combat it all by eating the last of the Christmas candy canes, shall I? And maybe some hot chocolate later on . . . I first picked up my (first) copy of Jane Eyre when I was around ten. I was browsing the Barnes & Noble children's classics and thought the cover, the mysterious plot summary on the back, and the hints at Charlotte's dark/sad early life influencing the book all looked rather interesting. I couldn't at the time put a name to what was drawing me in: the Gothic. It wasn't until a year or two later than I actually got through reading the book (I had started it, but been unable to continue). I read Emily's Wuthering Heights not long after, and followed about a year later with Charlotte's Villette. Within the next three years, I had also read her Shirley and Anne's Agnes Grey. Sometime around my first year of college, I finally got to Charlotte's The Professor and somewhere in there I also read two of her novellas written in her teens. I may have thought something along the lines of, oh, I've read all her books now, all Emily's, and have only one left of Anne's (The Tenant of Wildfell Hall, which has been sitting waiting on my bookshelf for years). I'm only beginning to grasp the vastness of Brontë material that's out there. I picked up a copy of the sisters' poems at the school library and I've been reading a couple a day. While some you could call simple, others are quite good, especially Emily's. And I have a copy of Charlotte's Tales of Angria--and there are plenty of Angrian tales not in that volume. While Angria was the fantasy world Charlotte and her brother Branwell wrote about, Emily and Anne wrote about Gondal--so there are the Gondal stories, also. Then there are the handy copies Selected Letters of Charlotte Brontë and The Belgian Essays. Some of this material is relatively new to publication. What may seem like material just for scholars is available to everyone. Goodness. Looking back on my post on the original 1978 Battlestar Galactica series, it's as if I knew that every single thing I said could be reversed to an opposite statement for the reboot series. When I posted on the short Galactica 1980 series, it's as if I knew what seeds of change that series was planting into the franchise. Although those posts were back in September, here I am in January barely having finished the reboot series. It's four seasons, yes, but that's still quite a long time for me. If I'm enjoying a series, I'll usually be able to at least watch a couple episodes every night. But when I started the new series, I went into shock. I didn't like it. I may even have hated it. I had commented on how refreshingly positive the original show was, but "hello, dystopia" became the theme for the new series. Darkness, pain, violence, anger, unsolvable problems, treachery, lies, disguise--everything terrible that you can think of. I didn't like any of the characters and the show wasn't making me feel good. I actually had to purposely start limiting the amount of it that I watched. I rebelled against this show for its darkness, the opposite of the optimism of the original. I rebelled at the way it relied on suspense, teasing you with action sequences and only the beginnings of answers to all the mysteries. But even from the beginning, I couldn't deny the production value of the show, also such a stark contrast to the budget-struggling originals. Sci-fi relies quite a bit on effects and design elements, and this show passed on all of that. It always presented itself as a complete world and a story that was unfolding, rather than individual stories for each episode. I didn't much like the first season, but I did start getting more curious towards the end of it. Season two catapulted into somewhat interesting territory, making season three start off with quite a bit of interest. By the fourth and last season, I was enjoying it. The development and the coming together of layers all came to show that nothing (or nearly nothing) was meaningless, whether or not it seemed important at first. There was obviously quite a bit of planning involved. I also appreciate the involvement of such things as symbols: it isn't becoming too common to casually find them in a TV show or movie. I did, however, feel like I wanted more answers or finality at the end of the show. But I think these feelings on my part were all part of the theme of "this has all happened before and will happen again." I'm not positive whether or not I liked the note the show ended on, whether I found it encouraging or disconcerting. But I think that also is the point: reality is confusing, and our involvement in the greater chain of events is not always easy to discover. So instead of the bright pioneer spirit, the reboot presents the complexity of seemingly-impossible situations. Although I prefer more optimism and can't quite mark this show off as one of my favorites, I have to admit that it does about everything a reboot should do: it builds off of both the 1978 and 1980 series (sometimes in a rather clever, half abstract way) and recreates just the right amount of the dynamics in order to make it an applicable product of 2003-2008 rather than 1978-1980. 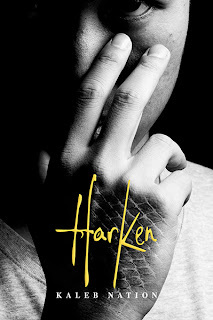 Why, you ask, after talking so much about Harken before the book came out, do I suddenly go quiet when it is finally released? The reason is that I can promote a book I haven't read before it's out, but once it becomes available, I feel that I have to have read it to say anything more. But one week has given me time to read in the morning over breakfast, in the evening over dinner, and sometimes during commuting. In a way, I think it's better that I didn't zoom through the book. One thing I must say: you know by now that I vastly prefer (personally--I'm not making a statement about which is better) hard copies of books and Harken is only out as an ebook for now. So I read it with the Kindle Cloud Reader, sometimes on my laptop and sometimes on my phone. It being my first time using it, Kindle's reader was surprisingly good, but I still feel like I would have a better grasp on this book if I had a solid copy of it to flip through. When it does come out as a physical book, you can be sure I'll get it right away. Anyway. This was an intriguing, entertaining read. 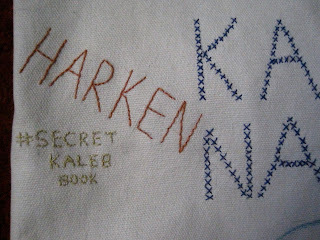 In comparison to the Bran Hambric books, Harken is more serious and more edgy. It isn't without smiles, but it contains a great deal more of the tear-type. A touch of mystery, a good smattering of thrills, and the warmth of human affection make up its main parts. That's one of the things I find myself enjoying about Kaleb Nation's books: the idea of family that is within them, in one way or another. Given that I make inevitable comparisons between stories, Harken reminded me of four things. Villette by Charlotte Bronte for the themes of identity (sorry: this is one of the books I have my head buried in right now for my honors thesis). Battlestar Galactica for much the same reason, along with others that will be obvious for anyone familiar with the series (it's because I'm finally getting close to finishing this show right now). This book called The Outsiders that I read in sixth grade and really liked; the comparison has to do with the characters and the colliding of worlds, so to speak. And The Host, also for reasons obvious. Well, Michael also reminded me of Peter Pan at one or two moments, but that may be too random (or not?). I'm not really going to talk about the plot, at least for now. I feel like this story is still new enough (and not yet finished, since there are at least two more books to follow) that I can leave that for later. What I will say is that Harken is driven by characters, characters relatable because of their fears and worries and failures but also because of their hopes for success and love for each other. It's the goodness, despite all the tragedy that is in this book, that drives it ultimately. That's what make this book compelling. 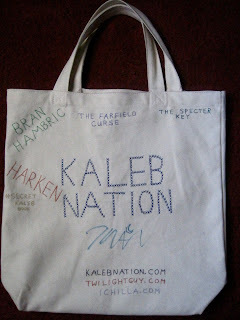 Oh, yes, and I've updated my Kaleb Nation tote. 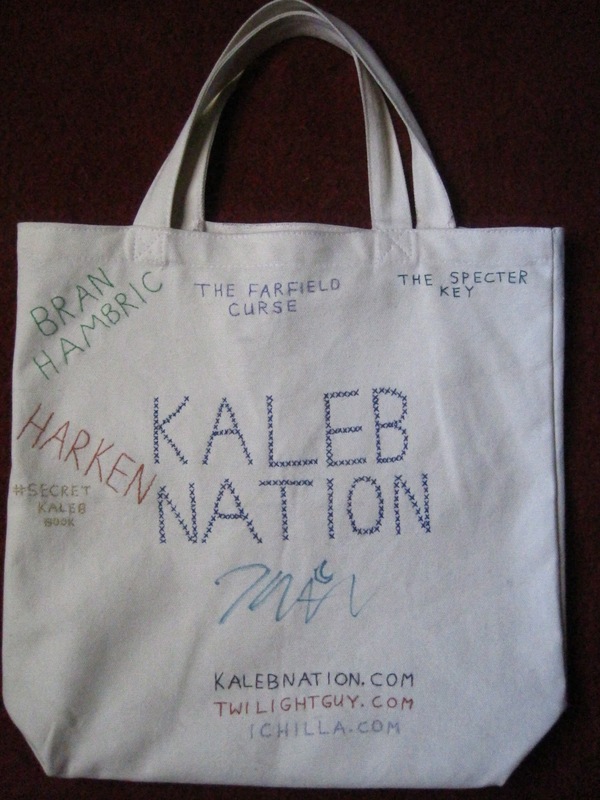 Yes, that's his signature on it from the book tour for Bran Hambric: The Specter Key. 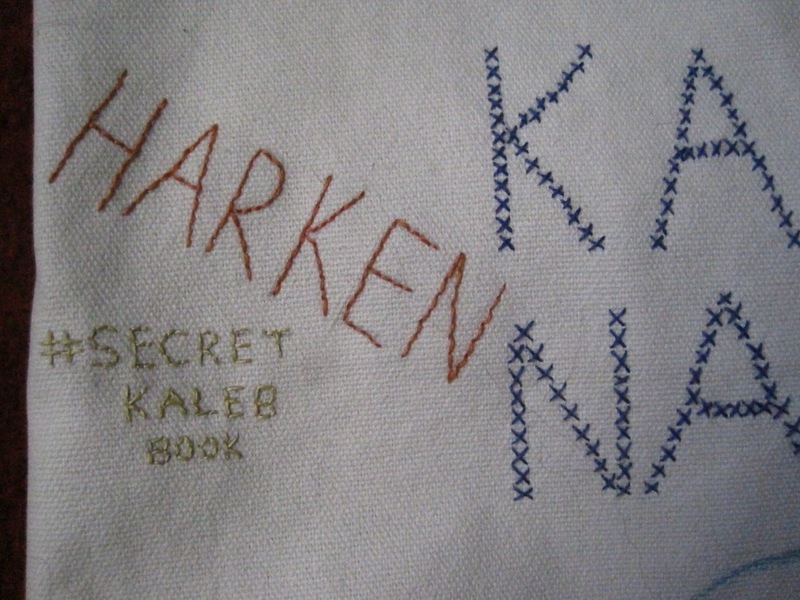 As you can see, I added an homage to Harken's early days before we knew the title and word was spread for the book using #Secret Kaleb Book. Goodness, how perfect were the marketing strategies for this book given its plot . . .
As long as I'm on the topic of food, let me share some silliness. 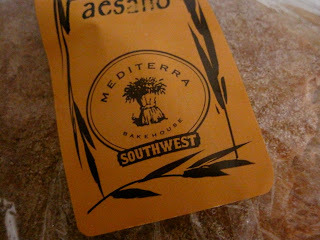 The time before last that I was at Whole Foods, I bought some sort of tomato sauce/pasta sauce base and this last time, I bought a loaf of rustic bread. They look innocent enough, right? That's right, Middle Earth! Goodness, how silly--though I'm sure they didn't have Tolkien's Middle Earth in mind, but still. The odder thing was that I didn't notice that the bread was ridiculous, too, until I brought it home. Mediterra? If you didn't know before how to translate that, it should be obvious now. 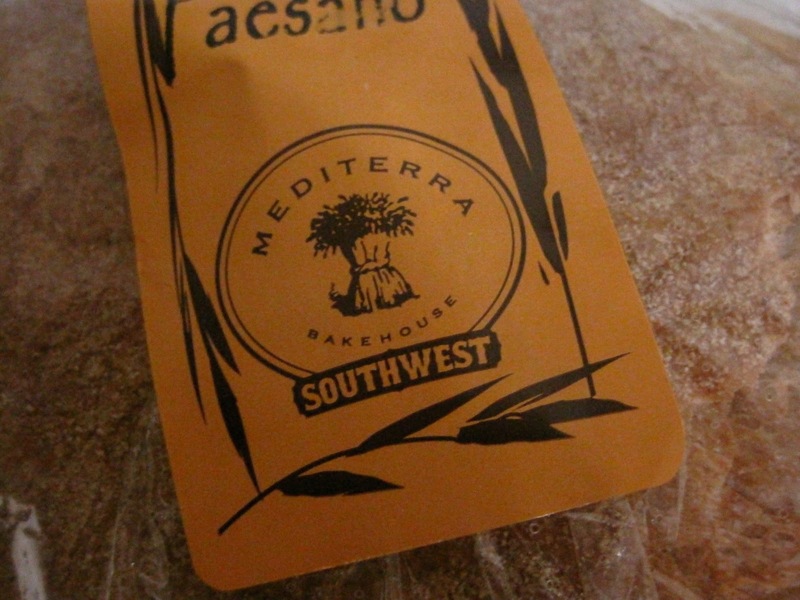 I think intuition must have led me to this bread, though I didn't notice its name at the store (I was too busy looking at the ingredients list and the city it was from . . .). Oh, wacky Tolkienians who see his world even in their food. Today let's talk about identity. One of the English classes I'm taking this semester is Transborder Chicano Literature. I've been kind of wanting to take it for a while since, living in the Southwest, I always wish I learned more about this particular area (reading Leslie Marmon Silko's Ceremony, which takes place in New Mexico, in my Major American Novels class, for instance, was great--but moments like that are infrequent). So much of this literature, so far, has dealt with questions of identity. And discussions like this make me wonder, do I deny part of myself and my identity? You see, let's put it this way: three of my grandparents were from Mexico. But I grew up speaking English and probably thinking I was white until I don't even know when. Even though when I was in kindergarden, it was a normal thing to visit relatives and hear more Spanish than English, in my bilingual class (that was my second kindergarten class--I started late here so the bilingual class was the only one open) I was with the English-speaking kids. It's kind of funny to think of now: I was probably the only Mexican girl grouped with the white kids, even though I realized no such discrepancy (kids really don't know race exists, do they?). But that's the funny part, too: I think I tend to look racially ambiguous. Especially before I came to Phoenix for college and got a tan: I used to be very white, and I still am light. Usually it was only the people who actually were from Mexico who could tell that that was my background, too. So I guess I always grew up on that line between worlds. The question I have now is whether that is a bad thing, whether I have missed out or repressed anything or some such thing like that. But what I find funny when I consider these questions is what I have, in some ways retained from that cultural background. I don't really speak Spanish, though I can understand some of it if people aren't talking too fast or if I can see it in print. I'm pretty sure most of the songs in Spanish I listen to are by Josh Groban. But I have the influence of food. That's right, I'm turning this into a food post. You see, especially because I live in Arizona, I don't always realize certain tendencies in what I eat--some of them are just normal to this area, no matter your background. But I have Abuelita hot chocolate in my cabinet right now next to the Earl Grey tea--but that's something they sell at Target. I have tortillas in my refrigerator--but they're from Trader Joe's. I made pinto beans last week that I bought at a farmer's market--but I also have a bag of black beans that I got at Whole Foods. I once got sad looking through all the stores because I couldn't find any jamaica (hibiscus) to make iced tea--but I don't remember ever drinking that until I was maybe twelve. I usually like tortilla chips best--but that's also because I'm part hipster and avoid the junk food Lay's/Cheetos/etc. I have Cholula hot sauce--and I can't think of an excuse for having it besides that I bought it at World Market. Oh, and I've been known to put hot sauce on eggs. And butter and sugar on toast (do they do that in the South, too? I'm not sure. 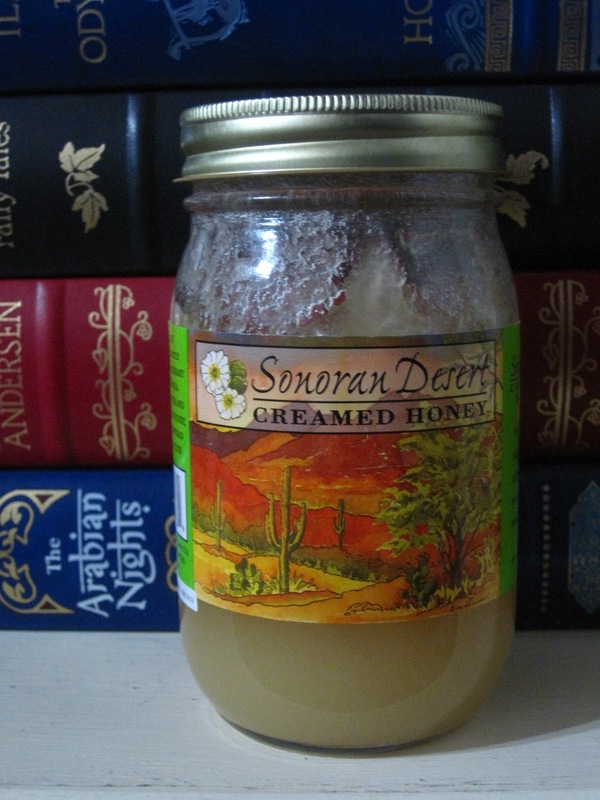 Although, lately, it's true that I've been switching the sugar for a mound of raw honey). What amuses me most is when I blend these things together: that, I feel, is me marking my culture. To drink my hot chocolate while eating scones or wrap salmon and spinach in a tortilla or drink jamaica while eating potato salad, those are the types of things I find entertaining. Because I think, ultimately, culture lives inside you. Identity is partly given to you, but also partly formed by you. And I have always grown up on those borderlines between cultures: and there I am happy to remain. Perhaps that's one reason I have come to have such affection for Arizona, despite not having been born here. Earlier this week, I met with both my regular advisor in the English department and my honors college advisor to make sure I had all the classes I'll need to graduate this spring. And I do . . . And I find that my GPA, to my surprise, is rather high--especially for someone who has never professed to have any interest in GPAs. So that leaves me with four months, maybe less than four months, until I graduate not just from college but also from Barrett, the honors college. In this delirious blog of mine, usually I tend not to give much in the way of personal details. But at this moment, I will give my age as twenty-one. Such an age makes my upcoming graduation even stranger: I'm just a couple years older than what some people are when they graduate high school. And yet here I am, sitting and looking at this looming horizon. But is it really a single moment, an epic event that will change everything? Four, three, even two years ago, when I told people I still wasn't exactly sure what I wanted to "do," that was okay. But now, "they" start wanting you to have an answer. And I may have one, as complicated and delirious an answer as I give to anything. But that isn't always the answer I "can" give: I realize the youngness of this day in my life. I realize that graduating college, while something to be proud of, is only one moment. Anything can follow it. And any number of things can follow it. There is not one single word that can encapsulate what the rest of my life after this moment will be, especially since I do not know yet everything that will happen in and affect my life. So for now I glance wide-eyed toward May. May the month of potential change, but also May the same month that has come across my life every year these two decades or so I have lived. May it be a month of gladness and courage, as well as one of accomplishment. When the YouTube channel for Team StarKid (the group behind A Very Potter Musical and others) released a book trailer for The Bully Book by Eric Kahn Gale last month, I was surprised to find a question in the comments wondering why StarKid was promoting this book. I was also surprised to find that many other commenters who were planning on getting the book hadn't heard of it before. I read the book over a year ago--and they call themselves StarKids? You see, this book came out in 2011 as an ebook, self-published by the author. I even wrote a ridiculous (or not so ridiculous) comparison of The Bully Book to John Gardner's Grendel. I would recommend you go back and read that post (link here) because, in it, I also placed some general commentary on The Bully Book. While I was concerned I might not have given it the attention it deserved, in looking back at my post I find that I stated the gist of things correctly (of course, certain comments are out of date now and not applicable to the new, print edition of the book). One thing I would like to add came into mind after I went to Barnes & Noble yesterday to buy the hard copy. After glancing at the post-holiday sales, I wandered into the children's section--and it had been a while since I'd been in there. It's such a partitioned off section that it almost feels like I'm not supposed to spend much time there, being older than twelve years old. (Although this wasn't as silly as the time I went there to buy books for a college class--that made me giggle.) Why, tell me, is this book (and many other books) labeled for an age group? Just because the characters are in 6th grade, does it follow that the readers must be in 6th grade? In fact, I think that this book might end up more meaningful to people who are older, at least in their early twenties--I am already finding it more meaningful now than I did back when I read it in September 2011. It's looking back on experiences of youth like this that can bring about a powerful reading experience. But I digress: I mean to say nothing against this particular book's labeling (since all books are forced into labels)--I only mean to encourage other people who are outside of its age group to give the book a try. You'll also notice a funny thing about the book jacket: it only covers the bottom two-thirds of the book. I was wondering why it should be this way, until I took it off to discover, underneath, The Book. How nifty! It's like having the novel and a piece of book merch all in one (and, yes, you have to have read at least some of the book to see what I'm talking about). So for fans of StarKid, fans of YA, and fans of fiction on social structures/relationships, The Bully Book is worth picking up. Oh, yes, and for the StarKids, you'll want to watch the group (along with Eric Kahn Gale, of course) reading the first sections of the book and answering a few questions. It is now the middle of the week--have you made plans for Saturday night yet? No? Well, I have an idea for you. As I have been reporting, Kaleb Nation's newest book, Harken, is coming out (in Kindle edition only for now--which means it's only $2.99) in just a few days. Given that it's an ebook, we can all conveniently go and get it right at midnight. So to keep us in entertained suspense until then, Kaleb Nation is hosting a livestream starting at 8 PM PT on Saturday the 12th. And viewers will have the chance to win prizes: a book poster, wristband, autograph, etc. To be counted toward winning, RSVP for the livestream here. Less than four more days. I am pleased to find that I am not the only one who found Peter Jackson's treatment of The Hobbit quite fitting--whatever complaints the critics make. You can read my initial thoughts on the movie here. Tolkienians will have already seen a certain article linked from TheOneRing.net, but I enjoyed it so much that I must give my own link. The article in question (click here to read it) is from The Huffington Post and it gives a much more detailed analysis than I have seen from any of the film critics--though, admittedly, I quickly stopped looking at reviews. This article draws from some of the topics I brought up, including the interaction of myths within Middle Earth and Tolkien's own adjustments to texts he had written. I also like that Seth Abramson brought in the potential flaws in the original movie trilogy: with the mainstream praise that they now receive, it can be easy to forget that most everyone doesn't like 100% of even those movies. Movies always have flaws: that's inevitable. But the value of what is brought to the audience has the power to make us look past minor flaws. So take a look at the look at the article if you still aren't keen on the movie's adaptation or if you're interested in some very in depth discussion. Consider it a way of celebrating Tolkien's birthday today. Edit: Here is another article from the Smithsonian that takes a look at the different texts Peter Jackson drew from. For my general thoughts on the first installment of The Hobbit and seeing it in HFR 3D, click here. Today's post is simply a comparison of that viewing experience to seeing it in regular, 24fps (as opposed to 48fps) 3D. I was right: the movie was better in HFR. It was much more stunning, crisp, and sleek in the visual sense. This format also allowed my eye to better take in all the details, particularly during fast-moving shots. 3D generally gives movies a kind of shakiness, if you will. It's not quite a blurriness during action shots, but it's similar to that. While the 48fps smoothened all of this away, I found it difficult to focus on certain scenes in 24fps. And while 48fps made it like watching the movie through a window, 24fps only added a little extra depth. My second viewing of the movie was ever so slightly visually disappointing. My reaction is this: if movies are made in 3D, shouldn't they also be in HFR? I know without a doubt that if I am ever choosing between HFR 3D and regular 3D again, I will choose HFR. It made the 3D much better--unless you're one of those people who can't get used to how the format looks. I know there are such people, but I frankly can't understand their perspective. The only unfortunate thing I may have discovered is that three hours of 3D may be too much for me (note: I've never had problems with 3D before). I remember feeling not quite sick, but a little off after seeing the movie the first time. I thought it was because I was getting hungry and had a late lunch and such. But the same thing happened the second time. . . and that time I had lunch almost right after the movie. It was New Year's Eve, and I felt not quite dizzy, not quite groggy, not quite nauseous until at least eleven that night. Was it the result of too much 3D? I hope not . . . but don't worry: I'm not too scared to watch a 3D movie again (I just wouldn't feel the need to watch 3D at home).